Dutch theologian, astronomer and cartographer. Born in Flanders, he studied theology in Germany and England. At the age of 24 he became the priest of the Dutch Calvinist church. Fearing religious persecution of the Inquisition, in 1585 he fled to Amsterdam. There he became interested in navigation and cartography. In 1589, Plantsius made a celestial globe on which he struck four new objects of the southern sky, using the reports of travelers: two Magellanic clouds (still nameless), the constellations of the Southern Cross and the Southern Triangle. In 1590, he created five maps of the Holy Land and a plan of Jerusalem for the Danish edition of the Bible, which had no equal either before or after its grace and content — each was decorated with 15 engravings on the themes of the Old and New Testaments. Over the next two years, Plancius issued a series of individual maps, and then in 1592 a large map of the world called “Nova et exacta Terrarum Tabula geographica et hydrographica”, which became very popular. At the corners of the map were placed the sky planisspheres, on which the constellations Dove and Warden of the Pole first appeared, which were not accepted by the community of astronomers. In 1594, he published the famous map of the famous world Orbis terrarum typus de integro multis in locis emendatus - the first in the history of cartography, decorated with allegorical multi-figure plots. This topic has become a leader in cartographic images of the world for two hundred years ahead. In the next few years, Plantsius acted as an assistant to the Dutch government in organizing expeditions to Eastern India, engaging in particular in teaching the celestial navigation of their leaders. In contrast to Spain and Portugal, having mastered the route to India through the southern tip of Africa, Plantsius hoped to pave the northeast route through the Arctic Ocean. The death of Barents in the third expedition in 1596 put an end to these attempts. Plantsius returned to planning expeditions to bypass the Cape of Good Hope, using them also for scientific research: the study of the southern sky and magnetic declination. On his initiative during the voyage of the Dutch merchant Frederik de Hautman in 1595-1596, his chief navigator Peter Dirkszun Keyser compiled a catalog of 135 of the brightest stars of the southern sky, inaccessible for observation in the Northern Hemisphere. Plantsius used 122 stars to compose new twelve constellations of the southern sky (the Southern Triangle constellation already appeared on the first Plantsius globe) and published them on a celestial globe made in conjunction with master Yudokus Hondius. These 12 constellations were placed in Johannes Bayer's Uranometry and are known as the new Bayer constellations. Rooster - the plot with the abdication of Peter; Mucha (Northern Mucha) - a bee from the history of Samson; Camel (Giraffe) - a camel who brought Rebekah to Canaan to Isaac; Jordan and Tigris - the rivers washing Eden; Unicorn; Small Cancer; South Arrow. The first six constellations were used by Barch, who published them in their heavenly maps of 1642, and are known as the new constellations of Barch. The last two constellations occasionally appeared in the maps of the 17th century and were soon forgotten. Only two of the eight constellations of Plantsius are recognized in modern astronomy - this is the Giraffe and the Unicorn. Unfortunately, Peter Plantsius was little known as an astronomer. His celestial maps and globes did not have a scientific status, remained unknown in wide astronomical circles, and the constellations proposed by Plantsius were subsequently attributed to his followers, and he himself was unfairly forgotten by historians of astronomy. A small fjord on the north coast of. 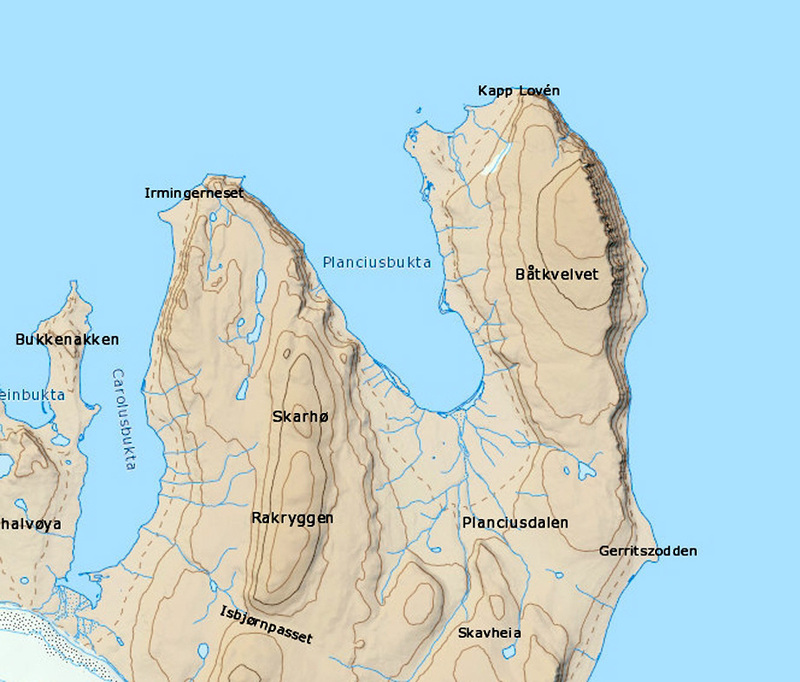 Northeastern Land and the valley at the head of this fjord. The coordinates are 80° 10'N 21° 20'E.